“We are data rich, information poor, insight starved,” said Steve Betts, CIO of AON, at ITC 2012. “Insight” is a good term to use. It conveys the idea of our existing ideas being changed or clarified by the addition of new information. It implies we're looking to take action. And it very clearly asserts that we're interested in how other people think. I also like “starved”. We really do need insights. We'll perish without them. 2013-04 Big Data: Fad or Future? My latest book presents the challenges members face when adopting industry standards as well as the opportunities that come as a result. 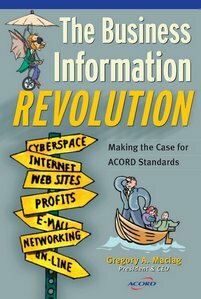 It features my discussions with many people over many years and follows the foundation I set in my first book "The Business Information Revolution". Industry standards are never adopted in a vacuum. They become part and parcel of all the trials and tribulations managers face in their day to day work. 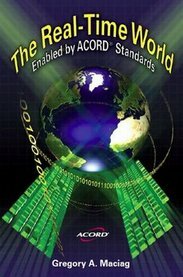 ACORD Standards are always part of a larger software development project that brings along people, priorities and politics. Adopting industry standards isn't simple, but the benefits far outweigh the problems of building and maintaining proprietary alternatives. I trust that you will appreciate my frankness, identify with some of the challenges and learn from what others have done to pave the way. This is a PDF version of my book. You have my permission to view, save and print copies for your personal use. Use your browser "Back" button to return to the blog after you visit or print a chapter. If you want a clean copy, it's available at the Amazon bookstore. This book was the end result of my writing monthly columns for ten years. Collision Industry Electronoc Commerce Assn.